Nickel Plated Wire Clip with rubber elbows. Order totals over $99.00 ship Free. Nickel Plated Classic Style Clip. Free Shipping on all orders over $99. 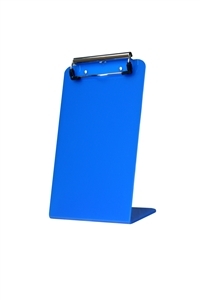 Acrylic Clipboard 6" x 9"
Neon Clipboard 4.5" x 11"
Poly Covered Clipboard 10 x 13"
Poly Over-the-bed Covered Clipboard 10 x 13"
.078" x 12" x 12"